It's a 1960 model, though some people have taken it for a '58. However, the smaller soundhole and two tier pickguard clearly aren't typical 58 features. The serial number is what causes the confusion - 2V123 appeared in both '58 and '60.
" Capri 335: It was formerly owned by Jimmy Vivino of the US Beatles tribute act Fab Faux. He's also a top session man who's played with the likes of Bruce Springsteen. The tone is bright and glassy - nothing like the sound of the modern high gain Rick pickups. The 360/12 is a 1985 example - probably one of the first of the V series reissues. I've owned it since 1991. It replaced an old 'new style' 360/12. The neck on that one was just too narrow, and I couldn't get on with restringing the R tailpiece! 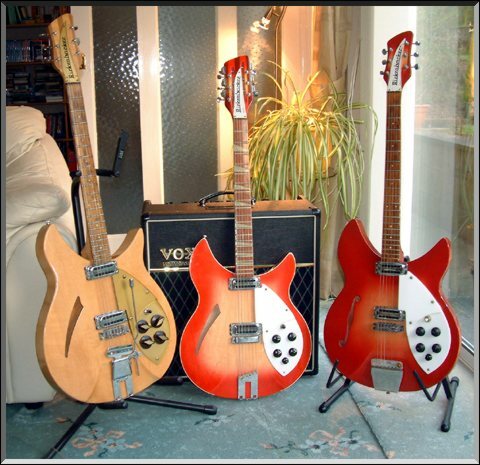 The V64 has a much more comfortable neck and of course it looks like George's which is what I wanted all along! 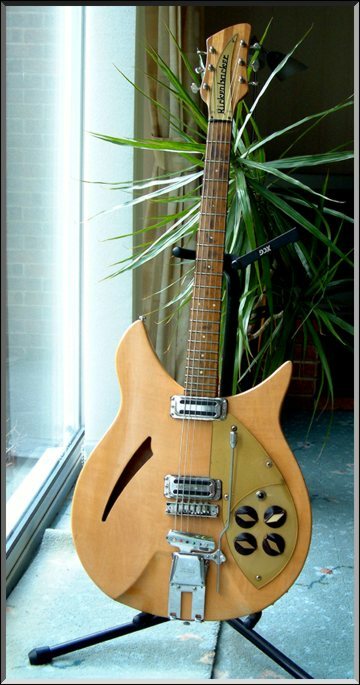 The Rose Morris model 1997 was the very first vintage guitar I bought, back in 1984 when it cost me just £315! I believe it's been refinished, at least partially, and there are signs of a very old repair to a neck break. The neck is very slim indeed. The pickups aren't as loud as the Capri, but they've lost the height adjustment grommets so they sit quite a way beneath the strings. The tone is undeniably vintage, though. It's worked perfectly these last twenty years, and aside from a spot of solder on the selector switch wiring, it's needed no work whatsoever."